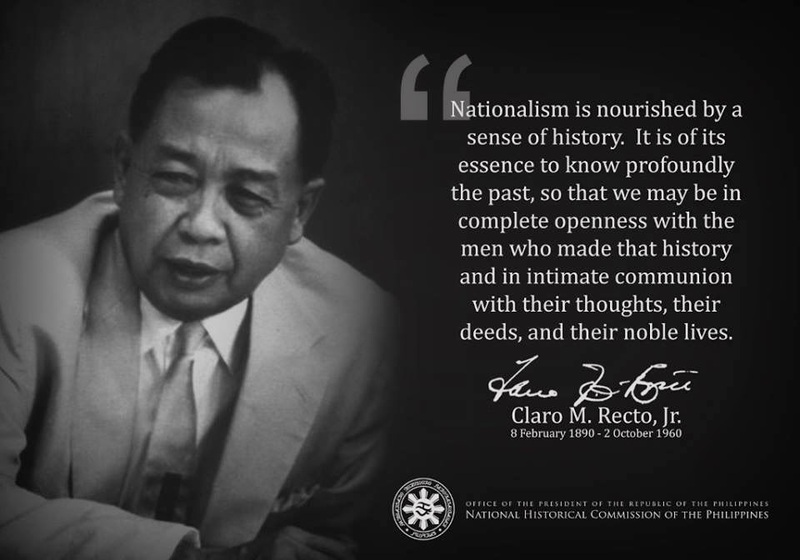 WHAT WE FILIPINOS SHOULD KNOW: Like many others, Fr. Bernas recognizes the paucity -if not complete absence- of strong and respectable leadership in the homeland. He also recognizes the fact that radical changes are necessary. Given that he is a churchman, he desires that the changes come peacefully. Unfortunately his wishes are bound not to happen. Radical changes in our homeland will not come slowly nor peacefully. History has shown and taught so many a times. 60+ years have passed and no significant reforms have been implemented effectively nor efficiently. All the so-called leaders, then till today, do not wish nor want nor will allow fundamental changes that will take away their institutionalized advantages over the common man. All their foreign partners will not welcome fundamental changes that will keep them away from perpetually exploiting the native Malayan Filipino people and robbing us of our patrimony. And that is why they have American troops re-establish presence in the homeland, ostensibly to train us fight "terrorism" (3 years now) contrary to our Constitution and thanks to the traitorous leadership of the Estrada and current Arroyo regime. Below is Fr. Bernas' article. BECAUSE I did not ask for the outright resignation of President Macapagal-Arroyo in my column last Monday, some friends texted me saying I was being wishy-washy. Looking for light as I was, I asked what alternative they had to offer. The only answer that came was from one who advocated a "supervised junta," to be headed by a group chosen by the people in some unspecified fashion. I am not sure what that meant. Neither have I seen any concrete proposal on how "the people" will choose those who will compose the "junta" or "council" or "high commission," or whatever you may call it, in a manner less disruptive than the way we conduct our elections. In the current confusion, however, people are asking how an extra-constitutional measure can work. An extra-constitutional measure is one that is not provided for in the Constitution but is not prohibited by it either. The People Power revolution of 1986 was not provided for in the 1973 Constitution except to the extent that the Constitution affirmed the sovereignty of the people. But the people who led the movement took the risk that, if it had failed, they could have landed in detention centers. Moreover, the people found a person around whom they could rally: Cory Aquino. It succeeded and the new government that was set up became acceptable to the people. In legal terms, it became de jure. That in brief is how an extra-constitutional beginning becomes constitutional. In the history of governments, an extra-legal movement can give birth to a new governmental system. It usually begins with the ouster of the ruling administration. The ouster can be violent, as in bloody revolutions, or non-violent, as what happened in February 1986. This necessarily means there is a force capable of "defeating" the power holders. The force can be military, as in armed revolutions, or popular, as in People Power. If it is through an armed force, it will mean that the military will rule either directly or through a civilian junta beholden to it. That is a most undesirable proposition. If it is through People Power, there must be a mass united enough to duplicate Edsa I and attractive enough to win the protection of the military. But above all, there must be a person or group around whom people can rally. Not one such group or individual is clearly in sight now. The bottom line is that for an extra-constitutional measure to rise to the level of acceptable legitimacy, it must succeed in winning a stable hold on power. This stable hold is sometimes achieved within a short period. That is what happened in 1986. It survived attempted coups largely because of continuing popular support. As to Edsa II, what happened was a clear attempt by its sponsors to situate it within the existing constitutional system. It thus won the support of the judiciary, the legislature, the military, the police and the masses. It was not a revolution. A revolution involves a change in the governmental system. It was only a change of administrators. The current administration claims legitimacy from the 2004 elections. That is whence the challenge started. The President has confessed to having called "an official" of the Commission on Elections. It could not have been for a merely friendly chat. And a call from the President is not an ordinary phone call. From the nature of the office that was calling and the nature of the office being called and under the circumstances of a hotly contested election, it can be said that the call or calls can come under the broad definition of the constitutional phrase "betrayal of public trust." It had the effect of undermining further the already suspect Comelec. She must be called to account for this. But what form of accountability will best serve the nation? This is the question that is fragmenting the nation. Mere confession does not suffice. And the challenge to her legitimacy has grown in complexity and has gone beyond mere electoral protest. The accountability options are resignation, impeachment, or pressuring a chastened President, if chastened indeed, to launch radical and visible reforms. Which of these will serve the nation better? Which of these will push the nation into deeper chaos? It is a question that is not easily answered. The mounting call for resignation is not unconstitutional. By itself it is nothing more than a call for the redress of grievances. This is a constitutional right of the people. If the President resigns and there is a smooth transfer of power to the Vice President, it would not be unconstitutional either. But there is every indication that the successor will also be pressured to resign. And if both the President and Vice President resign, the temporary takeover by the Senate president and the special election called for by the Constitution will also be resisted. The President has adamantly said she will not resign. I have no reason for not believing her. She will not. Meantime her capacity to govern has been seriously or, perhaps, irretrievably impaired. What then? I still believe resignation now will not solve problems. Impeachment, even if it succeeds in removing the President, will not solve the current problem either. What remains, it seems to me, is for a radical change both of system and of power holders to mature and win widespread popular support. It took Edsa I some time to ripen. The process of another maturation has begun. The increasing calls for resignation are part of the process even if now the callers envision conflicting futures. I join the calls now not because I believe that she will heed the voice of the people or that resignation will solve problems, but because it can lead to eventual popular consensus. The calls must peacefully spread.